Want a fun day out for the whole family? At Drayton Manor you'll find a wealth of activities and attractions that all ages can enjoy. And with a Drayton Manor promotional code, you can treat yourself to a visit without spending a fortune. Whether you want to see exotic animals at the zoo, enjoy white knuckle thrills on the rollercoasters or explore 'Thomas Land', Drayton Manor vouchers are a great way to save money and have fun. Drayton Manor theme park started life in 1949, when George and Vera Bryan opened a small amusement park with a handful of rides on land they bought from the Army after World War II. The park grew steadily throughout the 50s, 60s and 70s, expanding into bigger rides that attracted visitors from all over the UK from the late 80s onwards. Today, Drayton Manor is the fifth most popular theme park in the United Kingdom, with approximately 1.5 million visitors every year. Set in 280 acres of lakes and parkland, Drayton Manor is home to a wide variety of attractions suitable for everyone from small children to dedicated thrill-seekers. The park boasts seven big adrenaline-fuelled rides, including Europe's only stand-up rollercoaster Shockwave, water ride Stormforce 10 and Maelstrom, the only gyro swing ride in which riders face outwards. For the less adventurous there are plenty of gentler rides, as well as lots of live entertainment and theatre shows that provide great fun for the whole family. At Drayton Manor Zoo, families can get up close and personal with over 100 different species from all around the world including monkeys, birds, lizards and snakes. For smaller children, Thomas Land provides a magical opporunity for visitors to meet and interact with all their favourite characters from the Thomas the Tank Engine stories , with themed rides and attractions, an indoor pay area and a Thomas-themed gift shop. Don't want the fun to stop? With the Drayton Manor Hotel it doesn't have to. A luxurious 4 star hotel set on the outskirts of the park, the hotel offers 150 comfortable bedrooms, two restaurants and a bar, as well as a host of attractions for children including a games room, themed bedrooms, Thomas and Friends theatre and more. Want to enjoy a day out at Drayton Manor? With Drayton Manor discount codes you can treat the whole family to a visit without breaking the bank. Whether you have toddlers or teenagers, or even if you're just a group of adults looking for a fun day out, Drayton Manor vouchers will help you save money when you book your visit. Browse our website until you find the Drayton Manor vouchers that are right for you, then navigate to their website to book your visit. Select the date you would like to visit. Choose your ticket and click 'Add to basket'. 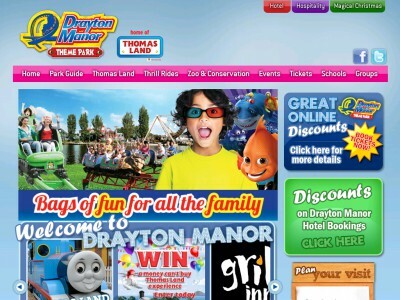 Enter your Drayton Manor promo code in the box provided and click 'Update'. Want to find out more about the exciting world of Drayton Manor? Why not check out the theme park's official YouTube channel? You can watch videos of riders experiencing the thrilling rollercoasters, find out about any new developments and check out all the great rides before you visit. You can also use the channel to find out about saving money with the latest Drayton Manor offers. Visit their website to book your visit. Enter your Drayton Manor discount code in the box provided and click 'Update'. Enter your details and payment information and click 'Continue'. If you have already made it as far as the payment screen, be sure not to forget to redeem your Drayton Manor vouchers! Want to find out more about what's happening behind the scenes at Drayton Manor? Why not follow them on your favourite social media platforms? You'll find all the latest updates and news from the park, competitions, ride and attraction features and more. You can also use these pages to find out more about saving money with Drayton Manor vouchers. Don’t forget to check them regularly, as you can never be sure when a free Drayton Manor promotional code might be waiting for you! Buy now online at www.draytonmanor.co.uk. If you’re looking for a great time with the kids, with friends, or just hanging out, then Draytonmanor.co.uk could be the perfect solution. This zoo/theme park/hotel has multiple ways to show anyone a great time, and with Drayton Manor vouchers or a Drayton Manor promotional code, the fun can be yours for less! Drayton Manor offers a wide variety of fun activities for people of all ages, and a Drayton Manor discount code (which is free and redeemable in seconds) provides you with a substantial discount. Don’t forget to grab yours the next time you want an adventurous day!